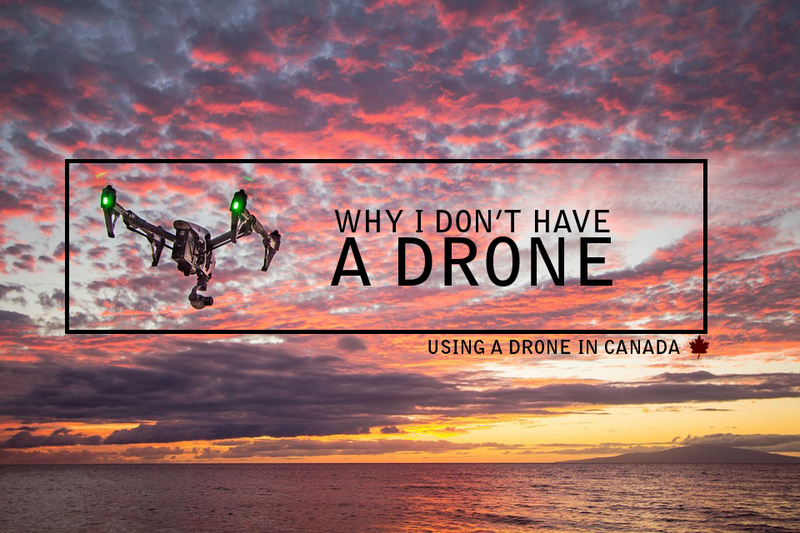 Why I Don't Have a Drone Yet : Some information about using a drone for photo and video in Canada. Before I start, I've got to mention how often I am at a shoot, mainly video, and a bystander will ask why I am not doing the same thing with a drone, and sometimes I just want to laugh..but I don't. 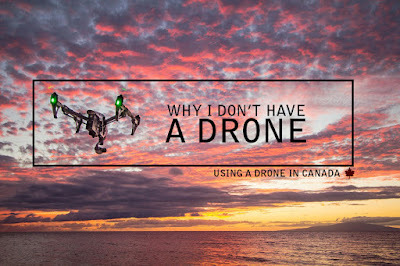 Instead, I'm going to lay it all out once and for all about my relationship with drones.. Get ready, this might be a semi-long one… But the info I share will likely be a great insight for just about everyone who is new to the idea of drones. Okay, so I get it - drones are super-cool new technology. It lets regular people like you and me shoot birds eye view - something we normally would never have been able to do even ten years ago. So thats awesome. But it's not great for everything. Once I was filming a wedding, and someone who worked the venue asked me why I wasn't using drone. Aside from seeing that viral youtube video of the bride and groom getting smoked by a drone and a bad pilot, which I aim to never do to a client - a drone doesn't actually make everything better. There are times when I can get a much smoother, nicer shot using my Glidecam stabilizer - a hand-held three axis gimbal stabilizer system for video. On the side note of Glidecam vs. Drone, here's a funny anecdote; on one photography forum, a drone user was trying to figure out how to pilot their drone indoors for a real estate walk through. I nearly burst out laughing. If you need to fly a drone indoors, for 20 minutes at a time, using a good - but not great camera - then you've clearly never heard of a glidecam, or have any idea how to make a great looking real estate walkthrough. I can tell you for sure that a drone is not the right tool for that job. How about batteries? A drone would be the only 'video support' that uses batteries. My super smooth fluid drag video tripod doesn't need batteries, my glidecam doesn't, my shoulder rig doesn't. So by relying on something that uses batteries, it does a few things. 1) it raises my cost per shoot - since you can rarely manage to do anything with a battery that maxes out at 20 minutes. and 2) More gear to track, it raises the difficulty by having more parts to manage and 3) it reduces my 'effective' work time. Then you bring in the batteries for the remote, and maybe my cell phone if I am streaming the camera's feed to my phone. So, no, not what I am looking for at this time. Lets talk about the mechanical movements now, this is a relatively small point in the grand scheme of things, but worthy of mention anyways.. So we get some pretty high tech radio controlled gimbals on these little jobbies now. In fact, you can easily drop upwards of $5,000 US on a good drone and gimbal, and if you want to get one with ultra-smooth motion in your video - thats basically the price point you're going to be looking at - or maybe thats just me being slightly a perfectionist, but… I definitely don't want to feel like I have to run all my drone footage through a stabilizer before I can use it - doing that I'd start eating into my processing time. And if you did stabilize every shot you took, well then you're losing resolution on your frame. Loss of resolution generally equals an equal loss of sharpness or clarity. Ok, so I went over a few points about actually operating the drone, and maybe thats just me being resistant to a dramatic change in my workflow. The legality however is the real kicker for me. It's the actual red tape you need to manoeuvre around in order to use it. Also, I am in Canada, so those are the rules I'd follow, but I understand the FAA in the USA could be even more demanding. So just keep that in mind, and pay attention to the rules of your locality. Before we get much further, its important to note that in Canada, the rules are divided by the weight of the drone you're operating, under 2kg being the 'easiest' 2-25kg not being overly difficult, and anything in excess of 35kg getting real complicated. Luckily, the popular drones a la DJI Phantom tend to be under 2kg so if you fly one of those, you've got it as easy as you can get it. For the purposes of this post I won't talk too much about the bigger drones, even though I'd want one that is big enough to fly a Panasonic GH4 or better, and not a GoPro (so it would be in the greater than 2kg class). At least 150m from any building - so basically anything inside a city is out of the question without a permit aka SFOC. So unless you're shooting some wilderness recreation in a remote location, you're probably going to have to navigate some red tape to shoot whatever you want. No more than 90m off the ground or 300ft. So thats not terrible, I wouldn't complain here, since the highest I can hold my glidecam off the ground is about 6.5 feet and I don't have a jib for my camera. haha. You need to have $100,000 at least in Liability Insurance related to the UAV system. You need permission from the land owner for takeoff and landing - so are you planning to use a local park? How fast do you figure they'll respond to your email if it is even legal in your area? You need paper copies on location of all the regulations, and all of the UAV operation documents - aka the manual. This is going to act like your license if a peace or other officer ever happens upon you. The rules set out by Transport Canada don't supersede any local regulations, so you'll need to scour all that local info as well. You can only fly in Class G airspace, which to properly define, you're basically going to need to learn what airspaces A through F are. (Since class G is classified as everything outside of those classes). And lastly, you're obligated to ensure that there are no radio frequency interruptions on the operating channel, so how would I do that - I am not entirely sure - do I need a $600 radio scanner for that? haha. And there are obviously more regulations than this, but these are the rules that impose the greatest boundaries and limits upon the use of a drone or unmanned aerial vehicle. If you want an exemption from any of these rules you need to apply for a SFOC or a special flights operation certificate from Transport Canada. They estimate it a 20 day process on the Transport Canada website. So what happens if you don't follow the rules? Well you could get up to $25,000 fine, and potentially jail time. Not that I'd break the rules, but no thanks! Wrap It All Up : What Does This Mean to Me? So I think it's clear now that there is a bit of education that needs to be done for anyone hoping to use a drone. For me, every piece of photography gear is an investment, and I try to always measure the returns on any piece of gear I buy. A drone would be the first piece of gear that has a recurring usage cost (outside of hydro to charge batteries) in that I would need to keep it insured like any other vehicle, in order to operate it.. If I don't use my glidecam in December, I am not all choked up, because it didn't cost me anything that month. If I don't use my drone in December though, I am losing money on it because its costing me in insurance - maybe only a few bucks, I haven't checked, but regardless. How about demand? Like I mentioned before, a lot of people ask me if I film with drones, if I am interested in drones, yada yada yada. The truth is, I've never had a real estate agent, or any other client actually ask me for an drone video or even ask about info regarding drone video in general. And if they did want drone video, I'd need to charge an extra arm and a leg for my time spent in getting an SFOC (you'll be flying closer than 150 meters to a house don't forget), covering insurance, and all the planning involved. To double my current price of a real estate walkthrough all because of what is probably going to be a 6-10 second portion of a 2 minute video is going to be a stretch to explain to any of my clients. When you think about an SFOC taking about 20 days to get, and most houses I photograph need to be shot that week, -- waiting three weeks on some government documents wouldn't benefit the agent, myself, or the home owner at all. Besides, how often do you see a real estate listing online and think to yourself "wow, this kitchen does look nice and spacious, but I wonder what the house and landscaping looks like to the birds and people in airplanes?" - probably never. Think You Can Get Away With it? Sure, its easy to think "who will know?" or something like that. But then consider this, if you don't want anyone to know, then that means you can't share the video with anyone online, or you'll be incriminating yourself. And if you can't share the video or photo, then whats the point of making it? I see heaps of aerial drone videos in micro stock agencies, real estate sales promotions, and for every single one, I can't help but wonder - "did they jump through the appropriate hoops?" because if they didn't, proof of their 'law-breaking' is now firmly engrained in the internet should anyone decided to go looking for the rule-breakers. There it is. A whole lot of my thoughts on drones. I know it's focused mainly on real estate photo and video, which may not be helpful to everyone. I chose real estate focus because the majority of drone videos that I've seen produced with 'commercial intent' tend to be for real estate sales, so that would also be my main focus and probably best bet to make a return on my UAV investment. If I can't make the return on my investment, then it's just a toy, and I'm too old now to go and spend $700 on mere toys. To loosely quote one of my favourite lines from Dragon's Den "I just can't see the valuation on it, so for that reason I'm out.."
Public Domain means anyone can use it without attribution, but I'm sharing attribution because I'm a nice guy. haha. thanks again for reading!